This piece is made using satinique cord in combination with a waxed cord in solid black. The length can vary from about 16 to 19 inches with a center jeweled piece that adds over 2 inches. 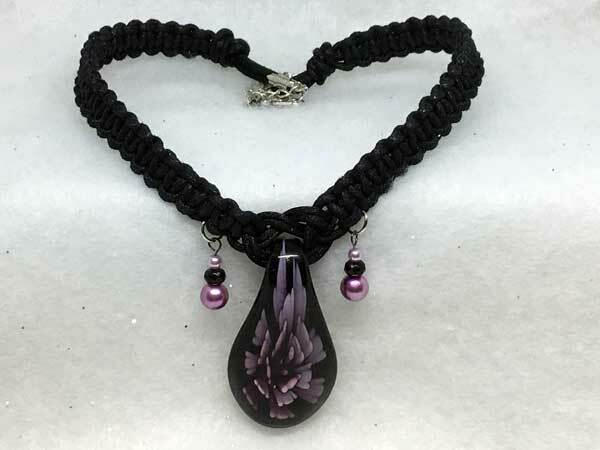 The focal pendant is a beautiful lampwork teardrop bead with a black background and a flowered design in varied shades of plum. On either side of the lampwork bead, I have added dangles made up of a large dark plum pearl rounds and small, light purple pearl rounds, with fully-faceted black glass rondelles in between.